Author(s): Alireza Khataee, Research Laboratory of Advanced Water and Wastewater Treatment Processes, Department of Applied Chemistry, Faculty of Chemistry, University of Tabriz, 51666-16471 Tabriz, Iran. Atefeh Karimi, Sang Woo Joo. School of Mechanical Engineering, Yeungnam University, 712-749 Gyeongsan, South Korea. Background: Many industries such as textiles, clothing, and printing use organic dyes to color products, which produces a large amount of colored wastewater that is generally hazardous and not readily biodegradable. Different physical, chemical, and biological treatment processes have been widely used for elimination of organic dyes from wastewater. Over the past few years, ultrasound has been widely used as an advanced oxidation process (AOP) for treatment of wastewater pollutants. Adding heterogeneous catalysts is a possible way to enhance the sonochemical degradation efficiency. This study examined the effect of adding nanosized bio-silica particles on the sonocatalytic degradation of AR17 in aqueous solution. 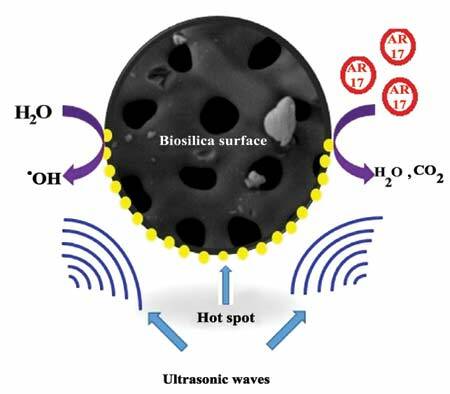 Methods: Sonocatalytic degradation of AR17 dye pollutant was performed in the presence of biosilica particles using an ultrasonic bath. In a typical procedure, a desired amount of bio-silica was suspended in 100 mL of AR17 solution with a known initial concentration and then sonicated with an ultrasonic bath. At time intervals of 15 min, a 4-mL sample was taken out and the remaining dye concentration in the solution was measured by a UV-Vis spectrophotometer. Results: By using bio-silica particles, the dye removal efficiency after 75 min increased from 25% to 94% compared with sonolysis alone. The decolorization efficiency decreased as the initial dye concentration increased. Adding NaCl and Na2SO4 as competitive anions reduced the degradation efficiency, indicating that free hydroxyl radicals are responsible for the sonocatalytic degradation of AR17. Five intermediates were successfully characterized by GC-Mass analysis. Conclusion: Adding appropriate amounts of heterogeneous catalysts can increase the yield of sonochemical reactions. The heterogeneous catalysts provide additional nuclei that enhance the number of cavitation bubbles, which enhance the yield of the sonochemical reaction. The results of kinetics investigation of sonocatalytic removal of AR17 which was studied with nonlinear regression analysis, are in good agreement with the experimental data (R2 = 0.993). Keywords: Decolorization, Diatomaceous earth, Nanocatalyst, Sonocatalyst, Sonodegradation. Affiliation:Research Laboratory of Advanced Water and Wastewater Treatment Processes, Department of Applied Chemistry, Faculty of Chemistry, University of Tabriz, 51666-16471 Tabriz, Iran., School of Mechanical Engineering, Yeungnam University, 712-749 Gyeongsan, South Korea. Keywords:Decolorization, Diatomaceous earth, Nanocatalyst, Sonocatalyst, Sonodegradation. Abstract:Background: Many industries such as textiles, clothing, and printing use organic dyes to color products, which produces a large amount of colored wastewater that is generally hazardous and not readily biodegradable. Different physical, chemical, and biological treatment processes have been widely used for elimination of organic dyes from wastewater. Over the past few years, ultrasound has been widely used as an advanced oxidation process (AOP) for treatment of wastewater pollutants. Adding heterogeneous catalysts is a possible way to enhance the sonochemical degradation efficiency. This study examined the effect of adding nanosized bio-silica particles on the sonocatalytic degradation of AR17 in aqueous solution.